Minneapolis police say they've made major changes in the way officers interact with those experiencing homelessness. One officer who is part of that change, Sgt. Grant Snyder, spends his days visiting people who are living under bridges and in tents. He hands out food and water and connects them with social service agencies. Angie Martin has been without a permanent address for the better part of a decade. These days she lives in a tent encampment. Martin's tent — and about a dozen others — are lined up in a neat row in the shadow of a concrete wall along Hiawatha Avenue. "This is the only place I do have to go. I have nowhere else to go. I have nowhere else to sleep at night. It's my home. It's what I call home," Martin said. She feels somewhat safer here than she did living under bridges on the Midtown Greenway. She said the group along the wall is fairly close-knit, and they look out for each other. Snyder also keeps a close eye on the group. He asks them if they'd like something to eat. When Martin said yes, Snyder handed her a packaged meal from a grocery store and a bottle of water. He makes regular visits to this and to other encampments around the city. Snyder helped Martin replace her cell phone and ID several times when they'd been stolen. His job is a relatively new one at the MPD. Snyder heads the department's Homelessness and Vulnerable Populations Initiative — an effort that started about 18 months ago. "We were having some conversations about what was lacking in terms of our relationship with our citizens, some of whom are without homes on any given day," Snyder said. "Nobody's going to be invisible, so those convictions that we speak with our words, we really have to back up with our hands." 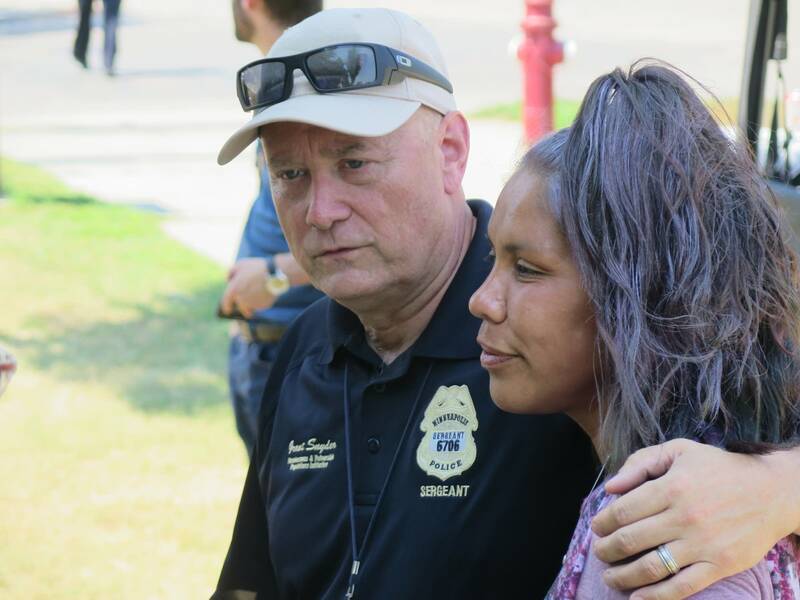 Mayor Jacob Frey and Police Chief Medaria Arradondo also visited the Hiawatha Avenue camp Wednesday to highlight the department's new initiative. Arradondo said it's part of a culture shift in policing. "Years ago we labeled our homeless community members as either vagrants or transients, and that was not by accident. It was a way to dehumanize them, and it was a way for them to become invisible," Arradondo said. Occasionally the police department removes tents from encampments because of concerns about safety and crime. But the chief said groups aren't evicted permanently and many people will return if they haven't found another place to go. Frey said finding permanent homes for people is the overall goal. But short of that, police officers can help ease the struggles of those living on the streets. • Conversation: How can we end homelessness in Minnesota? "It's easy to get caught up in big-ticket items, the budget, new developments," Frey said. 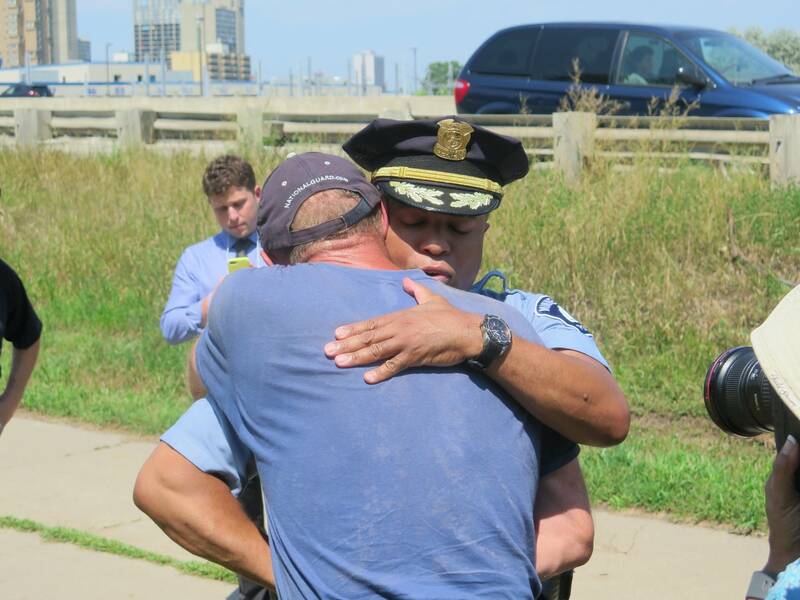 "But sometimes the most impactful and significant acts of our city are in these small acts of kindness." The mayor acknowledges that housing the homeless is a far larger task than law enforcement can handle on its own. But Frey said as the most visible part of city government, police officers are in a good position to provide frontline support.